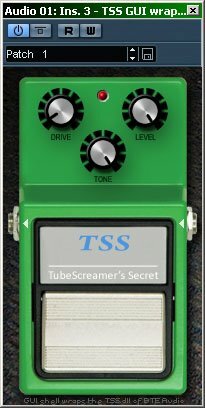 TubeScreamer's Secret from BTE Audio has a GUI of its own, but it kinda doesn't really show what an actual beast this three-knob unit is, so this GUI wrap was an attempt to visualize it, dressing it into Ibanez TS-9 style casing. I've never owned tube screamers hardware stomps, but if this is what they sound like... I might be going for one. Download TSS.GUI.Wrapper.rar (6 MB) a GUI shell that wraps the TSS.dll of BTE Audio.